This Reformation Day we went out and plundered the egyptians. 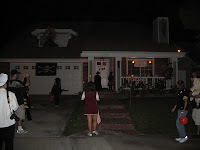 We joined our friends, the Ficketts, who live near several streets where they do it up big for Halloween. 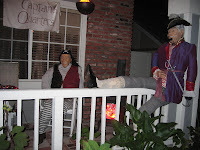 The "Pirates" house is always our favorite. Campbell dressed up as a swamp creature and Cooper donned his Darth Vader costume. 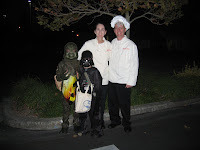 Of course, Bill and Kerry looked fresh from the kitchen in their chef's attire; Notice what lurks under Bill's hat, hailing a recent animated movie. Kerry informed Jay and me that we are required to dress up next year. I thought we were dressed up: a working dad and a housewife with 2 kids.